Considered the largest deciduous tree in North America, sycamore in Texas can exceed 100 feet in height and 4 feet in diameter, with a stout trunk and large, speading limbs that create an oval or round, spreading crown. Occurs along streams and on rich bottomlands throughout eastern Texas, along the major rivers of the Edwards Plateau, and southwest to Maverick County. Simple, alternate, 4" to 12" wide and about as long, palmately-veined with the 3 to 5 main veins ending at the tip of a wide lobe, leaf edge coarsely-toothed between the lobes; leaves are bright green and smooth above, paler and pubescent below, turning brown in the fall. The base of the petiole is hollow and covers the winter bud. Male and female flowers borne separately on the same tree as 0.5" round clusters on short stalks. A spherical ball about 1" in diameter, attached to a flexible stalk 3" to 5" long. During early spring the fruit balls break up into the individual nutlets, which have long hairs that help scatter them by wind or water. The bark on the younger trunk and large limbs is smooth and greenish-gray or white in color; as the tree ages, the outer bark of limbs and trunk flakes off in irregular, brown patches and exposes the nearly white younger bark beneath. Hard and moderately strong, but decays rapidly in the ground. Has been used for butcher blocks, rolling pins, crates, and tobacco boxes. Also used as a landscape tree. Mexican sycamore (Platanus mexicana) has leaves with fewer teeth and silvery undersides that is sometimes planted as an ornamental in the drier portions of Texas. 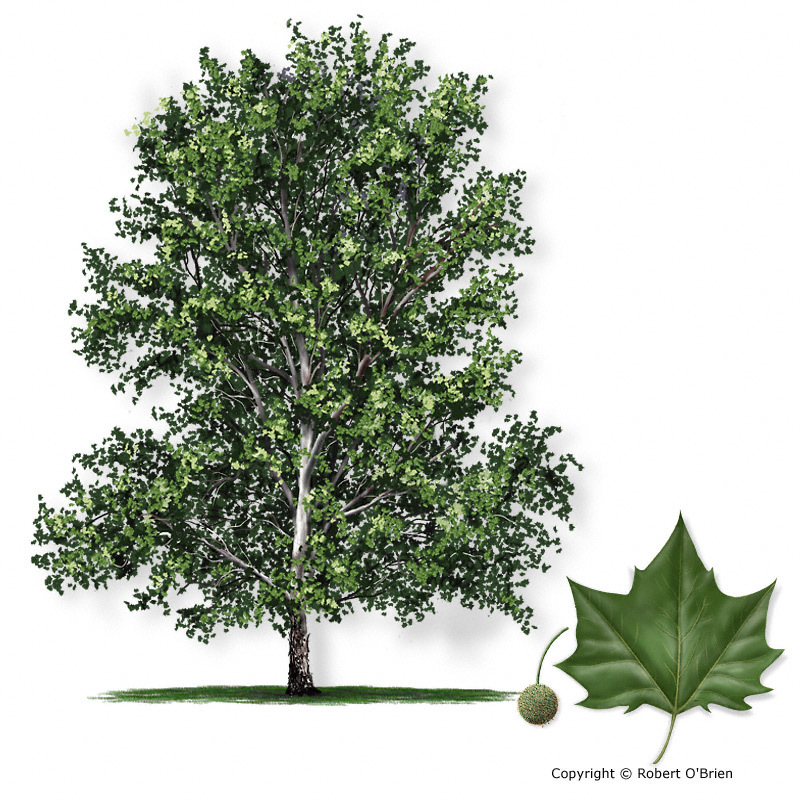 A hybrid of sycamore -- the London planetree (Platanus x acerifolia) -- has been widely planted throughout the eastern U.S. as a street tree and can be distinguished from the native species by having 2 or even 3 round fruits on a single fruit stalk.